I’ve been pondering upon “Ramadan Kareem” for the past few days. I understand that Ramadan is a special month for our Muslim brothers but the salutation itself is what sparked my interest; most especially when I received an email from Bayt.com, a Middle East job portal site. The image I’ve used for this post were from that same email. So to start this with, let me say “Ramadan Kareem” to everyone who is participating in this Islamic event. 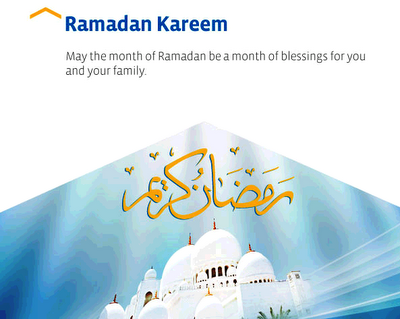 I now know that “Ramadan Kareem” apparently means “have a generous or bountiful Ramadan.” An alternative greeting on the other hand which is “Ramadan Mubarak” means “blessed Ramadan.” As for Ramadan, there is no direct translation. It simply refers to the ninth month of the Islamic lunar calendar where our Muslim brothers fast for a month. The fasting starts when the crescent new moon appears on the night sky since this moon phase normally represents the coming of a new month. Under this lunar calendar, the day actually starts at night fall. In the same calendar, there are also less days throughout the year compared to the more popularly used Gregorian or solar calendar. This year, Ramadan started July 20 and will be concluded on August 18. Contrary to popular belief, or at least mine, fasting for Ramadan is observed only during daylight hours. Before the break of dawn, Suhoor is allowed. This is where a meal is taken prior to fasting the entire day. Fasting ends with Iftar, a meal after sunset. The culmination of a day’s fasting is sometimes transformed into a banquet where numerous families, relatives, and friends gather to eat dinner together. This is especially true during the end of Ramadan called Eid-al-Fitr. Also, not every Muslim is required to participate. Children are exempted but they can join to start practicing what they will be doing in later life. Old people can also abstain from this practice. Other exemptions include instances of travel or when one is suffering from an illness and for women, it is when they are pregnant or breastfeeding, and with menstruation. But Ramadan is not just about fasting or not eating and drinking. Participants will also refrain from activities where physical desires are met including sexual activity. There is also abstinence or refraining from vile thoughts, words, and actions. In other words, one is expected to behave and think properly. This finds its roots in the Arabic word for fasting, which is “sawm,” meaning to refrain. This is done in order to cleanse one’s soul and to focus attention on God, whom they call Allah. Everyone will also need to reevaluate their stand in relation to Islamic teaching. Family ties should be strengthened; disputes and issues with other people should be settled; restraint from wrongdoing must be exercised; and everyone must live up to what is good. Alongside fasting, you will expect chants of salat prayers and recitation of the Quran throughout the day. Sawab or rewards of fasting are already expected to be plenty for a Moslem but it is believed to increase all the more during Ramadan. You’ll also see acts of charity where those who have more share food and other blessings with the less fortunate. For a non-Muslim, Ramadan means at least one or two more presidential decreed special holidays. Not that I’m at benefitted by it, being a freelancer online. But the main purpose behind Ramadan can be emulated by anyone, regardless of religious belief or affiliation. Christians even have a similar practice. Fasting is also observed except that it’s not according to tradition and it doesn’t happen on a specific month of the year. Anyone may fast at anytime. Holy Week during the month of April even allows the Christian world an opportunity for both fasting and penitence. Aside from the spiritual purpose behind fasting, there are other benefits associated with it. Fasting helps physically cleanse the body from toxins. There is also a significant drop in bad cholesterol levels in the body. On the other side of the coin, however, fasting may become harmful when not properly guided. Abruptly denying one’s self of food and drinks may lead a fasting person to end up being sick. Thus, fasting must be done slowly in a progressing way with food intake lessened for every meal until one can already completely avoid eating anything. But liquid intake should not be forgotten. Not eating should be supplemented by drinking lots of fluid including water and juice. I’m not a Muslim. I won’t be participating for fasting during the entire month of Ramadan. But I’m one with everyone who is practicing Ramadan at least in thoughts.